Named for Kentucky’s first governor, Shelbyville was incorporated in 1846. But it was not until the Louisville, Cincinnati & Lexington Railroad was built through the town after the Civil War that the city began to grow and develop economically. Not surprisingly, a handful of Jewish immigrants were drawn to the burgeoning town during this era. Perhaps the first Jews to settle in the area were Herman Rothchild and his family. Leaving the German state of Wurttemberg in 1851, Herman and his wife Esther bought a farm in nearby Southville, Kentucky, where they also opened a small country store. As late as 1880, Herman and his many children still worked on the farm. Herman’s brother Marks also lived with the family and helped run the farming operation. Herman’s son Louis Rothchild had taken over the farm by 1900. Herman’s oldest son Abraham left the family farm to open a store in Shelbyville just after the Civil War. During the war, Abraham had volunteered to fight for the Union army, rising through the ranks to become a captain by the end of the hostilities. His clothing business was a success, and Rothchild expanded the store after only a few years. In 1872, he sold the store and started a wagon and plow manufacturing business with a non-Jewish partner. In 1874, Rothchild went back to the retail clothing business, opening a new store that would remain in Shelbyville for the next 73 years. Abraham was very involved in Shelbyville’s civic life, serving several years on the city council. He was also head of the local volunteer fire department. In 1890, Rothchild moved his family to nearby Louisville, but kept his store, commuting by train to Shelbyville each business day. By the 1880s, Rothchild was joined in Shelbyville by a small group of Jewish immigrants from the same town in Austria: Tachau. Henry Stern came to the U.S. from Tachau in 1875, moving to Shelbyville five years later to open a dry goods store. He was joined by Bernhard Engle, also from Tachau, in 1887, who opened his own dry goods store. The two landsmen became business partners in 1899, though Stern soon left for San Francisco, California. Engle remained in Shelbyville a bit longer, but eventually moved to Charleston, West Virginia. Max Greener, another immigrant from Tachau, came to Shelbyville in 1884 from Jeffersonville, Indiana. A skilled watchmaker and repairer, Greener opened his own jewelry store, which flourished until his untimely death in 1905. That these men came from the same town in Europe was no coincidence. Greener was a cousin of Bernard Engle’s wife Bertha as well as the wife of another Jewish merchant in town, M. Oestricher, who had a hides, roots, and grocery business. The small Shelbyville Jewish community was closely knit together by these kinship and old world ties. 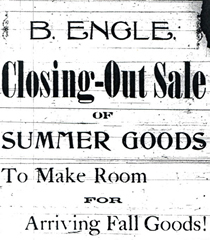 In 1898, 11 different Shelbyville merchants advertised that they were closing their stores for Rosh Hashanah. These included Bernhard Engle, Henry Stern, Max Greener, L. Samuel, E, Bernheim, Charles Schradksi, M. Oestreicher, Nathan Ruben, N. Goorman, Bertha Hilbroner, and the Louisville Store, owned by Moses Schwarz. Hilbroner was a widow who owned a hat store in town. Shelbyville only had 3,000 people at the turn of the century, and Jews made up a significant percentage of the local merchant class at the time. With this peak in Jewish population, the local Jewish community began to organize around the turn of the century. In 1895, they founded the Jewish Literary and Social Club. By 1900, the group had ten members. Bernhard Engle was its president, while Henry Stern was its treasurer. Shelbyville Jews also had a religious school and met for High Holiday services, though it’s unclear whether these were organized through the Jewish Literary and Social Club. In 1900, the local newspaper noted that Yom Kippur “will be observed by all the Hebrews of Shelbyville, who will close their stores from 6 A.M. to 6 P.M.” By the turn of the 20th century, the Shelbyville Jewish community was on its way toward establishing a formal congregation and perhaps even a synagogue. This would never happen though, as the Jewish Literary and Social Club had become defunct by 1910, along with the religious school and the High Holiday services. By 1937, only 30 Jews lived in Shelbyville. This decline was due to many merchants moving away, while those who stayed failed to produce a next generation. Three of Abraham Rothchild’s sons, Leon, May, and Edwin joined their father’s business, which was renamed A. Rothchild & Sons. After Abraham died in 1903, the local newspaper wrote that “few men in Shelby County were better known, and not one was more popular or highly esteemed and respected than he.” After his death, his sons took over the store. The three brothers ran the department store for over four decades, and became important civic leaders in Shelbyville. Leon served ten years as mayor of Shelbyville, from 1912 to 1922. Rothchild enjoyed the strong support of the Shelby Record newspaper, which editorialized that Leon was a “progressive and successful business man and has the city’s best interests at heart.” His younger brother Edwin served on the city council and was president of the Shelby County Fair for many years. May Rothchild spent thirty years as a director of the Bank of Shelbyville and served several terms as chief of the city’s fire department, for which he refused to accept a salary. The three Rothchild brothers, each a bachelor, lived together throughout their lives. When Edwin died in 1947, four years after Leon had passed, May decided to sell the department store, which was the oldest business house in Shelbyville at the time. The brothers had no direct heirs, and no Rothchilds live in Shelbyville today. A similar scenario played out in the Ruben family. Nathan Ruben came to the U.S. from Russia in 1882 with his wife Rebecca and their children. After a time in Danville, Kentucky, the family moved to Shelbyville in 1896, where Nathan opened a dry goods store. Sons Mark and Moses Ruben began to work at Bernhard Engle’s store before opening their own business, Ruben’s Store, in 1907. Moses remained in Shelbyville while Mark went on the road buying and selling merchandise for their women’s clothing and dry goods business. 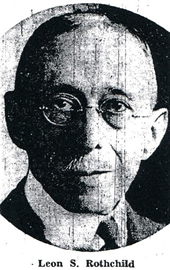 Moses Ruben became an important civic leader, serving as organizer and president of the Shelby County Building and Loan Association and as a member of the city water and sewer commission. He was also a city councilman. 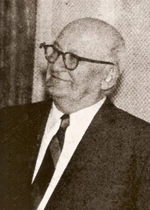 Moses Ruben ran the store until he retired in 1957. When he died in 1962, he left the bulk of his estate, $500,000, to establish a trust fund for a local hospital. Later, it became known as the Moses Ruben Fund for Shelby County, which supports local projects and charities. Moses’s younger brother Louis Ruben opened a dry cleaning business in 1924, remaining in operation until he retired in 1968. Louis was also active in civic life, serving on the local water and zoning commissions and as president of the Shelbyville Chamber of Commerce. Reflecting the acceptance Jews enjoyed in the town, Louis co-founded the Shelbyville Country Club in 1935. None of the three Ruben brothers ever had children; Moses a remained bachelor while Louis didn’t marry until he was 81 years old. Mark and his wife Corrine did not have children. ​Brothers Charles and Moses Schradski, who were born in Ohio, opened a dry goods store together in Shelbyville by 1895. They ran the business for the next several decades. The brothers remained single, living and working together into the 1930s. With the Schradski, Ruben, and Rothchild brothers failing to have children, the Shelbyville Jewish community was prevented from ever developing. One can envision an alternative scenario in which each of the siblings got married and raised multiple children. This growing number of Jewish children may well have inspired them to establish a congregation and a religious school. But this never happened, as the bachelor brothers instead traveled to Louisville for services. The Shelbyville Jewish community did not last. The proximity of Louisville, located just 30 miles away, made forming a congregation less necessary than in other places. Shelbyville Jews belonged to Louisville congregations, and could easily travel there on the interurban trains in the late 19th and early 20th centuries, and later on Interstate 64. When they died, their funerals were held in Louisville, where they were buried in the city’s Jewish cemeteries. Over the years, these funerals became more infrequent as Shelbyville’s Jewish population dwindled to nothing. If Shelbyville ever attracts another significant Jewish presence, it will be as a suburb of Louisville.